Special Report Last year, the UK's Cabinet Office asked an external management consultancy to examine staff morale and high turnover at the Government Digital Service. After interviewing more than 100 civil servants, its scathing confidential analysis described an organisation beset by low morale and run by a “cabal” management of old friends, who bypassed talent in favour of recruiting former associates – while Whitehall viewed GDS as “smug” and “arrogant”. Hire the very finest minds in digital and dress them in onesies. Have some fun while you’re doing it. Insist on Hawaiian shirts – absolutely de rigueur. Make sure your insignia is good. And have lots of cake. And make sure there's stickers. You can’t beat a few stickers for your laptop! He continued: “These all seem like trivial things, but going against the tide, going against the grain, making sure that it’s a bit of fun, bringing this generation in, is utterly crucial. We started that literally on day one when we started." It was easily mocked as "infantile". Yet Bracken's thinking was pragmatic. As a new unit reporting to the Cabinet Office, GDS couldn’t hope to match private sector IT sector salaries. Contractors, or “interims”, could stay up to four years and received as much as £700 per day, but permanent staff would be on much lower rates. Hence the need for "fun" as a motivational tool. Inside Aviation House, however, the reality was very different to the whimsical and informal picture GDS presented to the world. Three years after the Cabinet Office had approved Martha Lane-Fox’s blueprint for creating a new Whitehall IT unit, tangible progress was hard to find. The euphoria had given way to stress and high turnover. “People were doubling up on leaving drinks because there were so many,” one government source familiar with GDS told us. Morale had fallen so low that Cabinet Office management hired external management consultancy The Art of Work to find out why, and make recommendations. The consultants ran focus groups and conducted 1:1 interviews with over 170 civil servants. 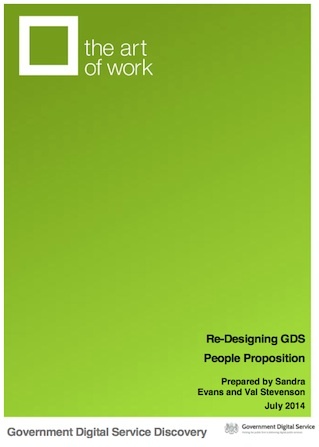 The final document, titled “Re-Designing GDS: People Proposition”, proposed nothing short of a “reboot” for the department. GDS needed to be “redesigned” with new management structures and processes. “People needed to be reminded of professional behaviours; arrogance was the most used word to describe those inappropriate behaviours; also ‘smug elitists’”, civil servants told the interviewers, in confidence. Consultants highlighted a “culture of thinking we are always right”. GDS staff thought that the hype GDS generated for itself contributed to poor relations with the rest of Whitehall. “I want comms to have humility so I’m not expected to be infallible or a member of a cult,” one protested to interviewers. The HR experts also highlighted diversity issues, with a predominantly “mono culture” that was “male, white, geeky”, in the staff's own words. Staff described “shadowy cabals” of management, according to the report. This led to low morale and, ultimately, high staff turnover. The Cabinet Office convinced the Treasury and Francis Maude that it had recruited crack “digital experts”. In reality, GDS lacked experience, strong track records in delivering ambitious projects, and – as “digital” experts often do – lacked basic technology skills.